A 73-year-old woman has been arrested after a body was found at the bottom of the cliffs in Cornwall. 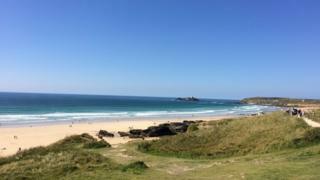 Officers were called by a member of the public who had spotted a woman's body near Gwithian on Friday afternoon. The dead woman was believed to be a 74-year-old from Wiltshire, officers said. Her next-of-kin have been informed. Devon and Cornwall Police said the arrested woman, from Westbury, Wiltshire, was held on suspicion of aiding or abetting a suicide. She was later released while inquiries continue. Police said the death was not being treated as suspicious and a file was being prepared for the coroner.